JEFFERSON CITY - A grieving mother spoke out on Tuesday in an exclusive interview with KOMU 8 News. 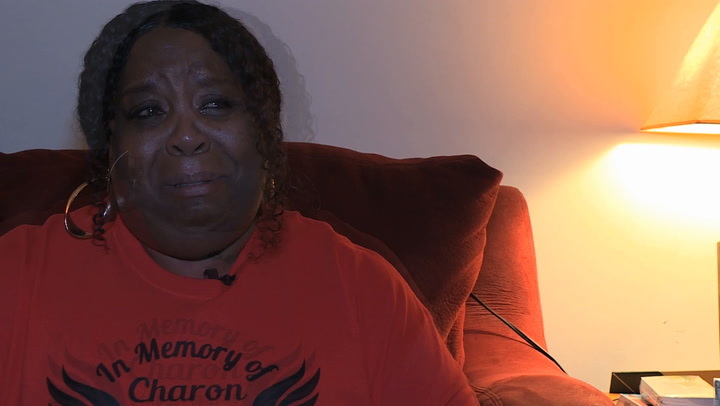 Surrounded by photos of her son, Schfonia Session spoke about the void in her home since Lincoln University student Charon Session was killed in an August shooting. "My family's broken, I'm broken," she said. Session said she still struggles when people ask how she is doing. "It's hard. People are always asking me, 'Are you okay?' Sometimes I say okay, but I'm never going to be okay again. Never," she said. Charon Session’s suspected killer, Alfred Chism, Jr. posted bond Tuesday. Cole County Circuit Court Judge Patricia Joyce had lowered that bond from $100,000 to $25,000 on Sept. 19, meaning Chism was able to walk out by paying just $2,500, the standard 10 percent. Schfonia Session is furious about that. "He gets to go home to his mom, look at her, she look at him. You know what I do everyday? I go to the cemetery and I sit on the ground and I talk to dirt. I talk to dirt, I have to rub dirt," she said with tears streaming down her face. Session said she is frustrated with the judge. "I just want to know, how did she sit down, come to that decision? She's a mother," Session said. “She cannot tell me she would not be as pissed off as I am if this was her child." Friends and family of Charon Session started a social media campaign, using the hashtags #JusticeForCharon and #WeWillNotBeQuiet. "I will not just sit by and just let that go. I will have justice for my Charon," Session said. For highlights from Schfonia Session's exclusive interview, click on the video above. Joyce reduced the bond even though a grand jury increased Chism's charge from second to first-degree murder. Mark Richardson, the Cole County prosecuting attorney, said a grand jury made the decision to upgrade the charges after looking at the evidence, but Joyce set the bond amount. “I’ve never seen someone out on bond in a murder one case, until now,” Richardson said. Bill Tackett, the former Cole County prosecuting attorney, said he has not seen an upgraded charge with a bond reduction in his career. “There’s something peculiar about this case,” he said. Tackett said bond amounts are determined by only two factors: whether the defendant is a flight risk and their danger to the community. Richardson said he opposed the bond reduction, arguing Chism is both. At the time of the shooting, Chism was on probation for theft. Richardson filed a motion Monday to revoke that probation. “At this time, it is the most we can do,” he said. Cyrus Taylor, longtime friend of Charon Session, said he thinks Chism’s release is an injustice. “Something has to be wrong because it’s not making sense to a lot of people and if it’s not making sense to a lot of people, something needs to be changed, because for him to be walking free is not fair. As hard as that is to say,” he said. Taylor said the social media posts symbolize the injustice involved in the case. “I think people on social media are trying to raise up a force and try to say, this is not okay, this is what we need to do about the situation and this is what needs to be changed,” he said. Taylor said justice would require Chism to face the consequences of his actions. Chism’s next court date is set for Oct. 17.